>HCH approaches to sustaining growth while meeting environmental and social challenges is to work determinedly to integrate the long-term sustainable development approach into its business practices, processes as well as product and solution offerings to the market and industry. HCH GROUP undertakes to perform its business activities constantly ensuring an ecologically sustainable development. Respecting the regulations in force, HCH GROUP protects and safeguards the environment by reaching the right balance between its own economic project and the environment. HCH received global certification according to the ISO 14001 international standard for environmental management from 2002. To sucessfully obtain global certification requires all HCH's manufacturing sites, technical and engineering centres and logistics locations, to maintain and uphold high performance standards regardless of geographical locations or social and economic conditions in China. With the validation and certification of our manufacturing facilities, we are taking a leading role in environmental protection. In compliance to the requirement of ISO 14001 environment management system, HCH continually demonstrates improvements on its environmental performance. 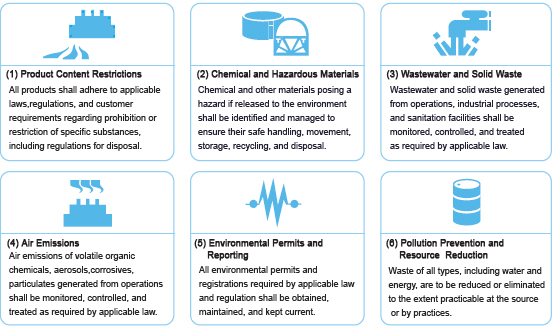 Targets are established and reviewed annually in tackling environmental challenges resulted from, for instance, greenhouse gases emissions, natural resources consumption, and wastes. Huanchi strives to contribute to a higher quality, more comfortable lifestyles by providing truly valuable products and services. At the same time, the company works to minimize the environmental burden of its various activities and promote greater harmony, thereby contributing to the preservation and improvement of a healthy environment.